Due to the expansion of forms of musical performance as well as to the deteriorating condition of our aging wooden concert hall, which was constructed during the university’s previous status as the Tokyo School of Music, the new concert hall “Sogakudo” was built in 1998. The design of the new hall places particular emphasis on facilities, acoustics, and function as a site for musical education and research, as well as being in complete harmony with the surrounding area. Furthermore, the harmonious acoustics of the hall are such that the entire hall acts as one giant musical instrument. 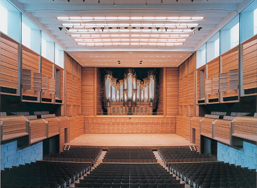 The concert hall is the first in the world in which the entire ceiling above the audience seating is movable, enabling the acoustic characteristics of the hall to be adjusted according to the music being played or the type of performance.